An early start, coffee, tea, clean up and prepare for departure including filling water tanks. Then we headed into town to see Paul and run the plan by him. By this time, Clare had thought about the possibility of us doing wide bay bar without Paul and perhaps meeting him at Southport instead. We went first to the tourist info to check out means of transport for Paul to get to Tin Can Bay. This was a more complex plan, but it was possible depending on his release. When we started to chat to Paul about it, his preference was for us to make the crossing and head to Southport and meet him there. So we decided that if conditions are favourable, that is what we will do. We had breakfast and coffee fro the hospital cafe with Paul, and then took our leave to provision. We found a small shopping r plaza next to the brewery where we got all we needed including cream buns! Then fuel for the car (crazy Ivan’s to find a servo!!) then back to the boat to get underway. We stowed the hire car, grabbed ice, prepared for sea and left the dock at 11:45. There was a light ENE at the heads, so we continued under engine until Clare had set a course and the breeze picked up to about 8 knots, when we set main and heady and stopped the engine to cruise at 6.5 to 7 knots, in sunshine. 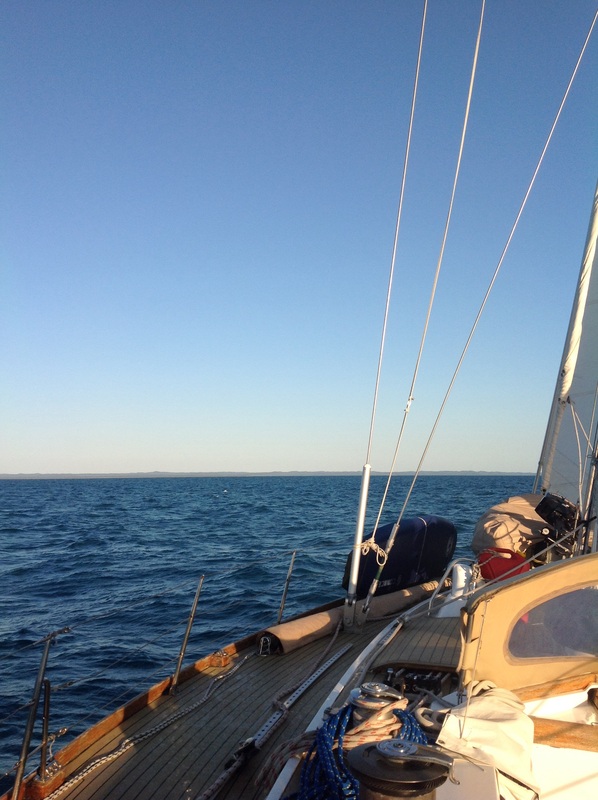 We had a glorious sail across Hervey Bay, but for all its fame for sea pets, we saw not a one the whole way from Bundy to the Great Sandy Strait. We popped in a reef when we saw around 18 to 19 knots of breeze and we remained comfortable. We did spot another yacht, and so a race ensued and we easily won, despite the fact that the other yacht was a ketch with way more sail area than us. We got to the Clearwater mark for the start of the strait at about 4:15, and so continued in towards North White Cliffs where we thought we would anchor. 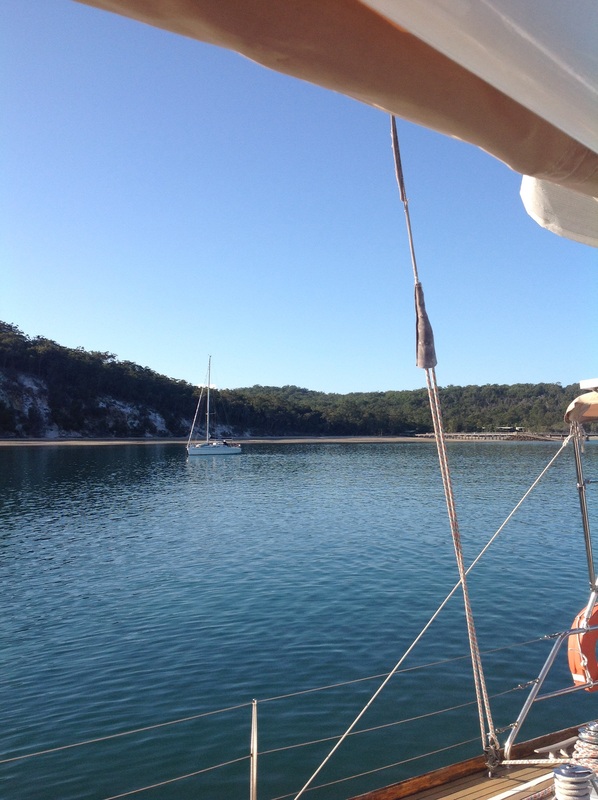 There was a discussion about whether we might carry on the South White Cliffs anchorage, to be that much closer to the shallows in the morning, but we decided to see how we went. As the sun set, we decided to take down the sails whilst we had light and clear water, and then we continued under motor into Kingfisher resort. It was around 7 pm when we got there and we could see a few yachts anchored, so we started the reccy to work out where to drop anchor. We wanted around 15 meters, but couldn’t find anywhere that was far enough away from other anchored boats, so ended up in a good spot but about 22 meters. Pete turned on fish and Chips and in the morning we realised we were on a very steep shelf! We set the anchor and put out about 60 meters of chain with the snubber, and sat to ensure we were definitely dug in and holding. As we did this, I prepared dinner, as the chicken wings Pete Marinaded on the way to Fitzroy, had been cooking since about 5 pm. We had these with a salad and potato salad and we all wolfed them down as though we had been starved for the last 24 hours! 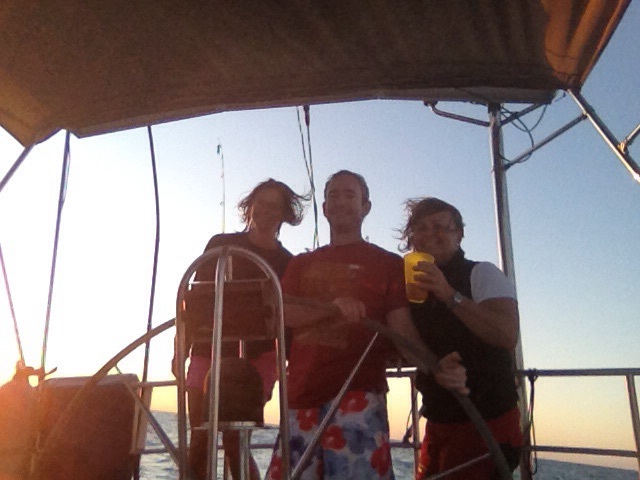 Then it was to bed for an early night, after setting anchor watches of Clare at midnight, me at 2am and Pete at 4 am. An uneventful night at anchor, though text from my mum about the Wales Fiji game and general unease kept me from a perfect nights sleep. Clare also suffered so we were lazy getting going, but on time for our tidal gate.